This is an award given to three students who achieve the most meritorious results in Leaving Certificate Mathematics nationally. 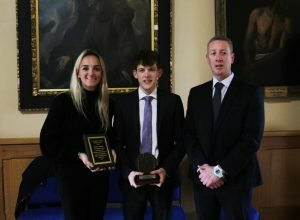 It was established in 2011 by the Irish Mathematics Teachers’ Association (IMTA) and was sponsored by Accenture Ireland from 2011 to 2016. The award is now solely the remit of the IMTA. This award is part of our role of promoting mathematics nationwide. It aims to recognise excellence in mathematics at Leaving Certificate level. The recipients are chosen by the SEC. 2017: Cillian O’Dochartaigh , Colaiste Eoin, Ciaran William Lennon, St. Kierans College, James Callanan, St. Benildus College. 2016: Jack Lewis, Colaiste Eoin, Evan Bracken, St. Mary’s CBS, Bethan Godber, St. Joseph’s Secondary School. 2015: Séamas MacLochlainn, The High School, Neil McCann, St. Michael’s College and Séan Kavanagh, Castleknock College. 2014: Keegan O’Mahoney Christian Brothers College, Cork, Karen Briscoe, Kinsale Community School and Gavin O’Driscoll, Hamilton High School. 2012 winners were Philip Clarke, St. Mary Diocesan School, Drogheda, Fiona McCarthy, Mount Anville Secondary School, Dublin and Joe O’Sullivan, Blackrock College, Dublin. 2011: The first recipient of the award was Alan O’Regan, a former pupil of Christian Brothers’ College in Cork.